We have launched a campaign today that aims to address the issue of irrelevant press release emails. To learn more watch the video below and then visit the An Inconvenient PR Truth website if you would like to get involved in the debate. Update: We have posted answers to the main FAQs regarding the animation here. The debate has also moved onto PRWeek UK here. I watched the film of Barack Obama’s nomination and subsequent presidential election campaign, By the People, on iPlayer over the last couple of days. Obviously we all know what a great communicator he is and the significance of his election, but getting to see up close what happened during the nomination and general election campaigns and how both he and the wider campaign team acted and responded was fascinating. As a huge West Wing fan it was like watching a real life version! The three words that kept coming to my mind were authenticity, humanity and community. In the order of their occurrence in the film these were some bits that stuck out for me. 1. Open and honest with people – refers to his own background and life on a number of occasions including referring to himself as still almost normal and sharing the pain of the loss of his grandmother. 2. Generous when giving credit – when talking to his campaign manager for Senator it is she who he credits for success not himself. 3. Calm – in both positive and disappointing situations like losing the New Hampshire primary after winning Iowa and the knock backs in Ohio and Texas. 4. Empathises – even with a nine year old over the act of shaking hands. 5. Relaxed – his body movement is so natural it’s frightening and he’s not bad on a basketball court either! 6. Community organiser – always talking about a grassroots movement for change. 8. Inspires all ages – even a nine year old volunteers to make calls for him and an older voter is out on the street campaigning for the first time since Bobby Kennedy. 9. Personal – asks everyone their name when meeting people on the street, recognising that names are one of the most personal things to everyone. 10. Nothing is impossible – Hillary Clinton’s 30 point lead in the national polls doesn’t deflect him. 11. Treats his opponents with respect – congratulates Clinton on Ohio and Texas, though sometimes uses light hearted humour to have a dig e.g. the “likeable” comment in connection with Clinton in the New Hampshire debate. 12. Truth – when he speaks his mind about race at the National Constitution Center even though he doesn’t know if it’s a good idea for the campaign. And above all the process it is not about him. 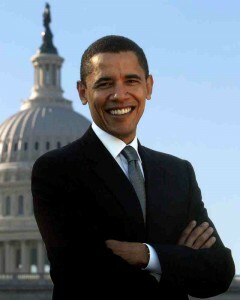 He is seeking an American victory and when successful in primaries the vote wasn’t about him it was about the people. “We are the ones we’ve been waiting for”. Messrs Brown, Cameron and Clegg these are the qualities I want in a leader and I suspect many other people might too. I realise that the current weather conditions are adverse – I am in Newcastle which is pretty badily hit – but in this day and age of technology there is no excuse for not maintaining communications. If you are going to make a big thing out of your attitude being different you need to demonstrate it. Update – I was contacted by Twitter shortly before finalising this post which was a good response and as I have said I don’t disagree with the sentiment about employee safety merely the lack of effort that would appear to have been made to “do the right thing not the easy thing”. Update 6pm, 8/1/10 - Have received a call from the Corporate Sales and Marketing Director at Simply Health who was in agreement that with hindsight more could have been done to maintain service levels. The “can be bothered” sentiment was expressed strongly with promises of actions to be taken and I will be updating this post as and when these occur. I hope to be able to report my trust being restored in the brand over the next few days. Update 9.30am 9/1/10 – Received a call from their customer services manager who had been alerted to my issue by their PR Manager. He apologised for the frustration caused, accepted the constructive nature of the criticism and promised action to resolve my issues first thing on Monday morning. Mark sounded very concerned to ensure that his customers were looked after. The response so far has been excellent, it would be interesting to know though what other customer experiences have been like. Update 3pm 12/1/10 – This should be my final entry. Have now been contacted by customer services they have processed my referral and an appointment is about to be made. An excellent service in the end. Would be good to know if Simply Health are going to put in place different procedures in the event of any similar situations, but I have definitely experienced evidence that they can indeed be bothered.